This manufacturer machines V-8 crankshafts that consist of a main bore that breaks out into seven different surfaces, some which are angled/irregular cast surfaces. They needed a tool solution that was able to reach all of the large exit burrs on the part. The solution from HEULE is a special C12 COFA with a 20° “M” blade and “S” spring. 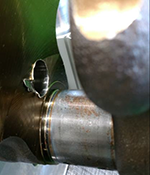 The COFA tool has a cutting blade which is able to pivot and successfully deburr all of the flat and angled/irregular surfaces by entering through the main bore to reach the seven different bores. The customer is pleased with the automated solution and the tool performance. Interested in the COFA deburring tool? Visit the COFA product page for more info.